A traffic stop early Sunday (July 23, 2017) morning resulted in a man reaching for a gun and fighting with Slidell Police officers. 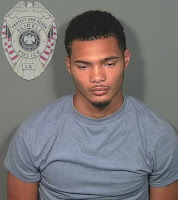 When Slidell Police stopped a vehicle on Gause Boulevard, a passenger, Xavier Batiste (19) of Slidell, provided a false name and was acting aggressive towards the officers. The officers noticed Batiste reaching in his waistband, at which time the officers attempted to restrain Batiste. Batiste fled on foot, but was caught in a nearby parking lot. Batiste continued to fight with officers, who were eventually able to restrain him. During a pat-down search, Slidell Police officers located a .357 Smith and Wesson revolver in Batiste’s waistband, marijuana, and other drug paraphernalia. Batiste was arrested and charged with: resisting an officer by false information, resisting an officer by flight, illegal carrying of weapons, possession of marijuana, and possession of drug paraphernalia.